Starting next Saturday, 11 Jan, we're trialing six weeks of KO Circuits. A 45 minute training session that begins with a 10 minute warm up and moves into 4 or 5 rounds of interval training. In this case, it's short bursts of intense activity with brief recovery periods and rest periods of 1 minute, every 3 minutes. Repeat this with 4 or 5 different activities that challenge the entire body. Get the gloves on and fire punches at the bag as hard and as fast as you can for 20 seconds -, ease off (but stay active) for 10 seconds and then do it again. Repeat this pattern 6 times and then rest for 1 minute. Move to a new station and perform the next exercise in the same pattern. 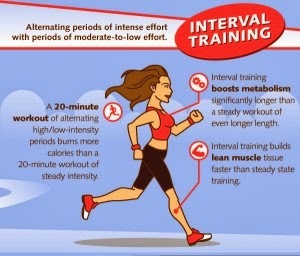 Read more about interval training. Without going into the science and to put it in its most simplistic form, it's a fast way to burn fat, improve your fitness, overall health and ability to perform exercise. Oh and it's not boring. Anyone looking to improve their fitness level. Simple as that. It doesn't matter whether you can run a 6 minute mile or have only ever run a bath. You work at YOUR pace and push yourself to go faster or harder than you did last time. Every time you do it, you try a bit harder and every week you become a bit faster and fitter. It never stops. Wear - comfortable clothing that doesn't need adjusting (sports bras strongly recommended for women), indoor trainers (no trail shoes) or boxing boots.